I have not much to write about to-day. The heat was terrific yesterday & the previous day, but it is cooler to-day. On the way home yesterday I called at the cemetery and watered our grave and Maud’s. They were parched. The best of our blooms are now over. Maud has written to the Office to say she will return on Monday. She has been away since 6th July. She has never written me since I told her to give her heart away. I think I have at last stopped her gushing “friendship” for me. I hope so. Mrs Taylor called in this morning. She was on her way to the dentist and brought a couple of your post cards for me to see, dated 20th and 27th July. 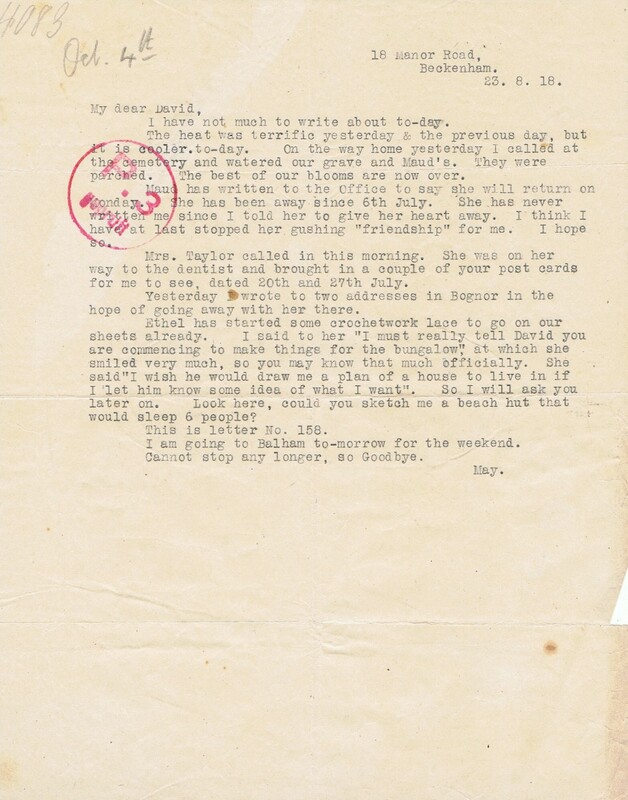 Yesterday I wrote to two addresses in Bognor in the hope of going away with her there. Ethel has started some crochet work lace to go on our sheets already. I said to her “I must really tell David you are commencing to make things for the bungalow”, at which she smiled very much, so you may know that much officially. She said “I wish he would draw me a plan of a house to live in if I let him know some idea of what I want”. So I will ask you later on. Look here, could you sketch me a beach hut that would sleep 6 people? This is letter No 158. I am going to Balham to-morrow for the weekend.